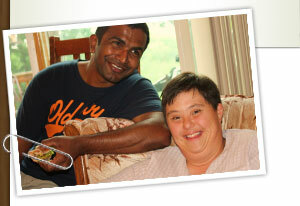 This section offers some suggestions for forming a friendship with someone who has an intellectual disability. The stories and videos give a window into how rewarding such a friendship can be. Anna and Rebecca have been friends for a long time. Anna first got to know Rebecca in the Spirit Movers dance group. After she learned how to care for Rebecca’s needs she could relax.It does not matter that Rebecca does not speak. They both get a lot from their friendship. They do many things together, and they make each other happy. You may think you will feel awkward or anticipate that you will be bored. In fact, people who have a friend with a disability usually say they receive much more than they give in the relationship. What you will receive is often intangible–as is true with other good friendships. Each friendship is different, so the receiving comes in different ways, but after a while you will have only to reflect a bit on your inner state to understand the gift in the friendship. This document provides a link to a website that will help dispel any discomfort you feel about engaging with people with intellectual disabilitites. This DVD-Rom continues the story of the life of Rebecca Beayni and the many people whose lives she has changed through the gift of friendship and her enjoyment of dance. PDFs of Teacher’s Guide for use with the film are available free on the Education page of larche.ca. This part of the website highlights just a few examples of the many effective programs across Canada. Some are national, some locally based. We offer these hoping they will inspire other good programming. This section is for people who might like to become friends with someone who has an intellectual disability. You will find suggestions and inspiring stories about the value of such friendships.